This morning ACD suffered a rather severe outage. There was no damage to the site, but due to the circumstances (Sandy) I have made a backup of the database. I will soon start backing up the image files as well (just in case). Join the ACD mod team in congratulating Jae on his promotion to Global Moderator. Jae has long been a valuable member of our community offering a great deal of help to everyone. Good news Jae, the pay raise amounts to double pay. There is a little section of the site devoted to what we call "Friends Of ACD". It is a collection of spotlighted links for dealers, manufacturers and helpful sites belonging to members in good standing here at AlternativeCruisers.com. It is a way for us to recognize the contribution that these people and/or companies have made to all the members here at ACD. Today, I have added ScootersOnly (Kathie) and All American Auto Sales (Ivor) as recognition for their continued support. Kathie and Ivor; Thank you both very much for the help and advise you offer to our members. It is very much appreciated. PS: If anyone has a nominee for consideration, please let me know. White w/ light blue piping, red "ACD"
All patches are now $1/ea, shipping included. Min. $4 inside US (to cover shipping), if outside the US message me before sending money. Let me know what you want, both color and quantity. You can send payment directly to norrisjc@gmail.com using Paypal, just be sure to include your CURRENT address and colors of patches desired. If you ordered a shirt from me, I can reduce the cost of the patches to about $1.25 each regardless of quantity and ship them with your shirt. Well ACD, I have some sad news to report. I have been trying to contact an old friend of mine and a fellow forum member, OBXbiker, since February with no luck. I have contacted mutual friends, other forums' members, and every email and phone number I have and could find for him. All with no luck. In June I heard a rumor that he had passed away. I joined several websites to try and step up my search for him, but sadly saw his name and age on the Social Security Death Index. I have not been able to find anyone else to confirm this by an obituary or a family member, but after presenting the findings to the other administrators of this forum, we decided we should make this information public and maybe as a community, we can say our piece to a friend who greatly influenced this forum. 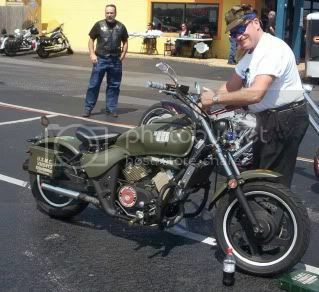 OBXbiker, known to a few as George Barlow III, loved living in the Outer Banks of North Carolina. He knew the area's history, businesses, and people like he was county commisioner. OBXbiker was an original member of the ACD forum, way back when. During ACD's formative years, there was a lot of passion about how the forum should be raised. George felt it necessary to break away from ACD and establish another forum which would be more to his vision. Many members of ACD became members there as well and after a few years, George and Bill were able to mend some fences and welcomed each other at both forum sites. OBXbiker's forum has been offline since January 2011, which was another clue that something was terribly wrong.